Employee health in construction is a top priority. Hazards abound in the building industry, but if construction managers get the right message across to workers, everybody wins. Accident rates go down, workers feel safer and work better, and project delays are avoided, not to mention possible fines for unhealthy working conditions. Cancer in construction causes as much as 40% of all occupational cancer illnesses in deaths in all industry sectors. Breathing deficiencies and lung disease come from inhalation of chemicals, vapors or dust. Skin diseases result from exposure to toxic substances. Back injuries come from incorrect handling of heavy objects. Noise and vibration cause further health problems. Falls, crushing and similar injuries come from unstable surfaces and vehicle-related accidents. The fewer employees are exposed to any risk, the greater their chances of remaining in good health. Some risks may be difficult or impossible to avoid. Working on scaffolding is likely to be part of many building projects. In that case, risk must be minimized by ensuring proper scaffold construction and correct employee safety procedures. In other cases, risk can be removed, such as substituting non-toxic materials for toxic ones can be done without affecting the overall quality of construction. Evaluate Construction Health Risks. This can be particularly challenging because of the constant changes going on in construction projects and the wide variety of professionals called on to deliver a complete building, bridge, or other structure. Plan the Handling of Risks. Each risk requires a solution suited to that particular risk. You’ll also want to define how risk reduction or handling will be measured, and the goals to be achieved. Get Everybody On Board. Clients, main contractors, subcontractors and workers all have an essential part to play in helping foster healthy working conditions and eliminating unhealthy environments or practices. Find out from employees ‘on the ground’ what works and what needs to be improved. Monitor and Adjust as Needed. A plan, metrics, and worker involvement are a good start, but health and wellbeing are ongoing items and need continuing attention. Training. Online construction health and safety training courses can help plug those critical information gaps. Health campaigns with team challenges and themes including healthy eating, healthy heart and back care, good working practices in hot and cold weather, sun and cancer awareness, and dust and respiratory health. Health-related KPIs (key performance indicators) with monthly reviews to make sure health campaigns are being executed, and that appropriate drug and alcohol testing is performed on new employees. Certified management training to help managers help employees to better health and wellbeing on the job. A subcontractor guide to better construction worker health and health toolkits made available to small and medium business partners to help them commit to the right levels of employee health. 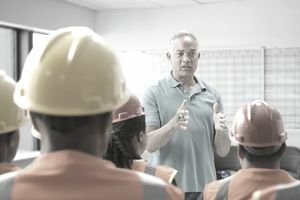 Through better understanding and better communication, and by embedding it into a project as a key priority, construction managers can improve employee health.